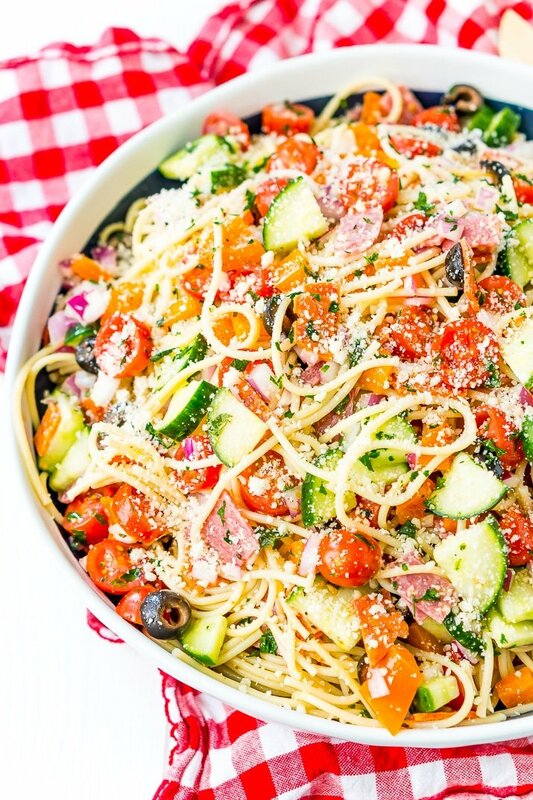 Spaghetti Salad is loaded with veggies, pepperoni, and salami, then tossed in an oil and vinegar dressing. Topped with a sprinkle of parsley and lots of Parmesan cheese, it’s a perfect summer meal or side dish! 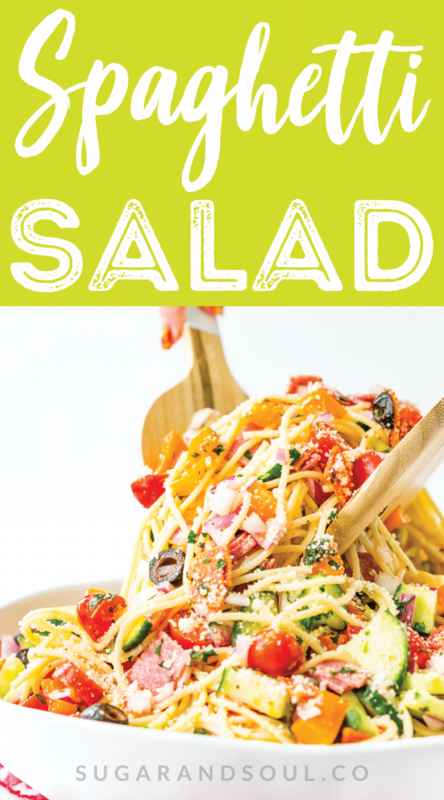 Everyone loves pasta salad and spaghetti is a tried-and-true favorite, so why not combine the two by making this yummy Spaghetti Salad? If you’re ready for a change from the old ziti-and-shells routine (or your pasta pantry is only equipped with spaghetti! 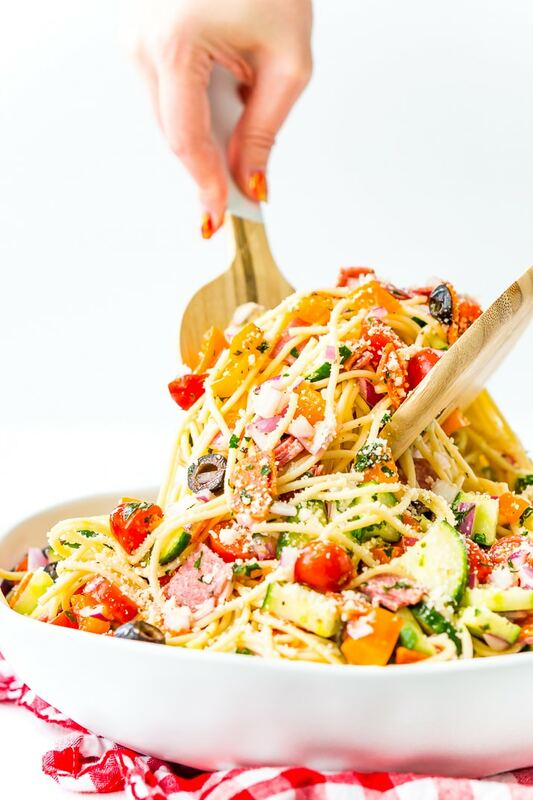 ), this recipe puts a twist on traditional pasta salad by calling for the long, twirl-able noodles instead of bite-sized ones. Spaghetti Salad is loaded with vegetables, so it’s a wonderful way to feature fresh produce from your garden or local farmers’ market! Olives, onions, tomatoes, cucumbers, and peppers add crunch to the tender noodles, while pieces of salami and pepperoni give a hint of bold flavor. The ingredients are tossed in a simple Italian dressing of olive oil and red wine vinegar that’s spiced with salt, pepper, and garlic powder. But you can also use a store bought Italian dressing in place of the homemade recipe. With a sprinkle of fresh parsley and a generous helping of Parmesan cheese, this zesty side dish is perfect to serve and enjoy at summer cookouts and celebrations! Not only that, but you can make a meal of this stuff! If you’re looking for a light dinner that won’t sit too heavy on a hot summer night, try serving your pasta cool and Spaghetti Salad-style instead of hot with a red or cream sauce. Another fun thing about this recipe is that you can customize it however you want. Try making it with cherry tomatoes, chunks of mozzarella, red pepper flakes, or anything else you have in your kitchen. Don’t forget, the Fourth of July is coming up, and if you’re hosting or heading to a get-together, this tasty dish is perfect to share with friends and family. 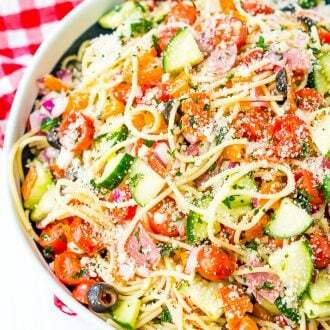 Spaghetti Salad is a light summer recipe that combines two classic favorites into an unexpected dish. Try serving it as a side with summer fare, or as a light meal all on its own! 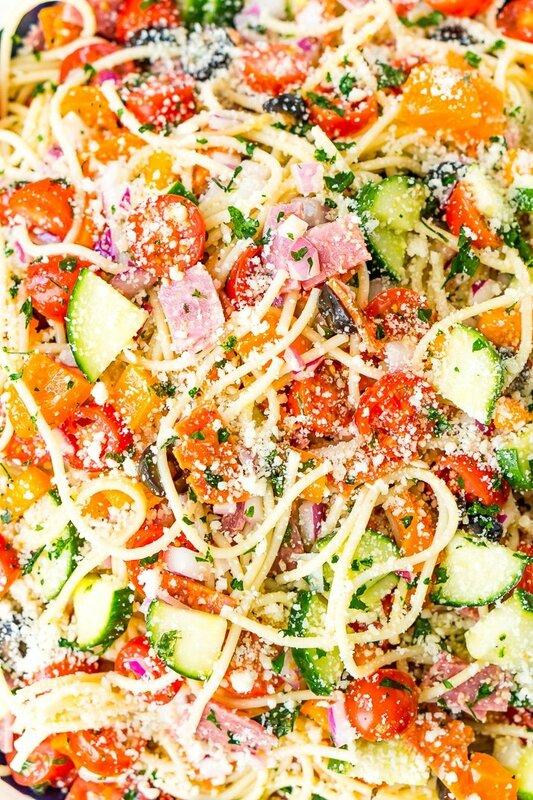 Pin this Spaghetti Salad Recipe for Later! Cook the spaghetti to al dente according to package directions, strain and run cold water over it to prevent further cooking. While spaghetti is cooking, prep your vegetables and whisk together the dressing ingredients in a medium bowl. Add the cooked pasta, vegetables, dressing, parsley, and Parmesan to a large bowl and toss to combine. Chill in the fridge for at least two hours to allow the flavors to build. Turkey Pepperoni may be used in place of salami and regular pepperoni. Store bought Italian dressing may be used in place of the homemade recipe. Salad should chill for at least 2 hours and can be refrigerated for up to 4 days. Cheese can be omitted for a dairy free side dish. Thanks! Even my anti-salad hubby will eat this! Wonderful! I hope you all enjoy it!